Databases For Charities: What now for Care, Integra, Donor Strategy...? Advanced Computer Software, the latest owners of the Care/Integra/Donor Strategy/Charisma stable of CRM software systems for charities has been sold again, this time to US private equity firm Vista Equity Partners, in a deal that values the company at £725m. So what does this mean for the charities who use said products? After all, this is now the fourth time that Care, for example, has been sold in the last 9 or so years. Can charities continue to keep faith in the software? To some charities, it must seem like deja-vous. For many years, Care Business Solutions was a ‘family-owned’ company and many large charities such as Marie Curie, WWF, Amnesty, PDSA and more have bought Care, and it was and remains a sturdy system. But in the last 9 years or so, Care has been sold first to the CS Group (mid 2000’s), then IRIS (in 2007), then ACS (early 2013) and now Vista. At the same time, Charisma was sold to Systems Group who then got sold to CSG and then, well, see Care. And sadly it hasn’t been plain sailing for all clients. If you talk to charities and consultants then certainly the time under IRIS was not perceived as a happy time, and that was reflected partly in new sales. And on each occasion, unsurprisingly, clients have been promised “development plans”, “new investment” and “stability”. I don’t know how many think they have received that. I’m an independent consultant who really tries to present both sides of any story. And so I really want to provide a balanced analysis to show the pros and cons of such changes – but on this occasion I am struggling. I can certainly say that the key products listed above are still robust and operationally sound - which is something we should never ignore - and they have to a degree been developed (witness ACS’s NG development) and some of the staff from the various incarnations have stayed on. And of course there is nothing unique in such takeovers - it happens throughout the commercial sector and other NFP CRM systems have of course been bought and sold and continued or discontinued. But at the moment I am wondering if such upsides are outweighed by the issues and possibilities which occur with such change: first there is continuity of investment (or not); then the continuity or otherwise of strategy/approach/technology for the clients and their ability to plan; indeed, consistency all round. 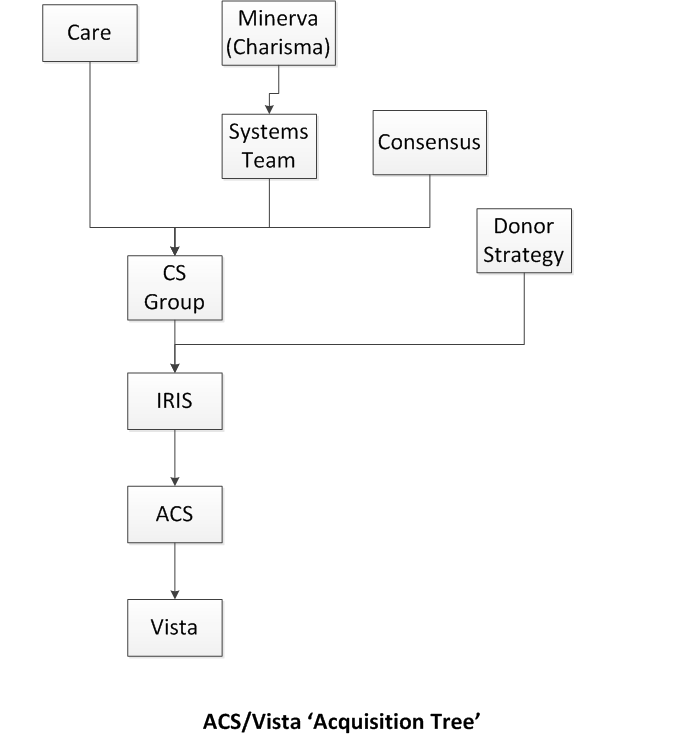 And it is surely unsettling for the company’s staff (and although some staff have stayed, I understand that at least one of the buy-outs mentioned above caused considerable staff turnover); and also as mentioned above, the time under IRIS did not give Care/Integra users the best experience and certainly didn’t provide many significant new fundraising database implementations. So I guess I should start with the hackneyed but fair phrase: “time will tell”. That said… if you were currently looking for a new CRM system for your charity then where would you look? ACS already had competitors in at least Blackbaud, Salesforce and Microsoft Dynamics for their top-end fundraising solution (and more for some procurements), and thankQ for their mid to high-end NFP prospects; and their membership offerings had/have very strong competition from several Microsoft Dynamics ‘templated’ options as well as other vertical sector products. So if a charity was to ask me what I thought was the future for Care et al then I would want to wait until we hear more from and about Vista. Basically, will it be different this time? Or will the 'acquisition tree' above continue to grow? Interesting piece. Whilst I'm not particularly familiar with any of the products named, I do know that I've been approached by organisations that do use some of these, any they are clearly looking to migrate away to something that might offer the stability, continuity and long term value that users of products like these cherish so highly (or at least they should). The product they are thinking of moving to? CiviCRM - a community powered open source CRM system. What's fascinating here - for me at least - is that where perhaps a few years ago open source was viewed with great wariness or even scepticism, it is increasingly being seen as an option that does deliver on these key issues. Are user organisations finally seeing past the suited and booted gloss of the marketing pitch and beginning to identify where the real long term value is? As you say in the piece, time will tell, but if the history of open source in the OS marketplace is anything to go by, we are now seeing the rise and rise of open source as the business model of choice in niche markets such as CRM.